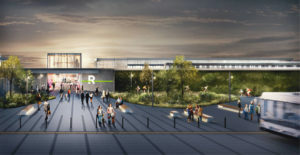 Architectural renderings of the Réseau express métropolitain stations in Québec. The Réseau express métropolitain (REM) project office and the City of Montréal have launched an advisory committee to ensure the new transit network integrates seamlessly into the various living environments and communities it will serve. Composed of seven members, the advisory committee’s mandate is to submit comments and observations to the REM project office regarding the various components of the project’s architectural signature and its integration into the urban landscape. “The arrival of a new public transit network like the REM is an opportunity to create new living environments through innovative integration and efficient facilities. With support from our partners and the communities, our goal is to ensure that the REM is harmoniously anchored in the urban setting,” specified Macky Tall, CEO of CDPQ Infra. From the very beginning of the network’s planning stages, the REM project office worked closely with the City of Montréal to define the vision for integrating the project into its surroundings. Guidelines were developed and submitted to qualified consortiums within the framework of the request for proposals (RFP) process, enabling them to develop their own design charters. These design charters were evaluated separately by independent experts. The successful consortium, NouvLR (which includes architectural firms Lemay, Bisson Fortin, Perkins + Will, and Provencher Roy), has developed a design charter and will be responsible for applying it to the REM design.